The Simba Dickie Group has announced its plans for 2019. The company led by CFO Manfred Duschl plans to build a fully automated high-bay warehouse with 13,200 pallet spaces in Thuringia, among other places. As one of the top five toy manufacturers in Europe, the Simba Dickie Group has set its sights high for 2019. In order to optimise the Group’s logistics, which are concentrated in Germany, a new high-bay warehouse is to be built in Sonneberg, Thuringia. The automatic small parts warehouse will also be expanded. It is also planned that Sonneberg will also take over the logistics for other foreign subsidiaries of the group. The company estimates the costs for this to be around 15 million euros. In addition, a further ten million euros will be invested in Germany, including in machinery and equipment. In addition, the group is expanding the showroom at the Fürth Stadeln location by around 600 square metres. Organisational changes are also imminent. For example, the company Noris-Spiele Georg Reulein GmbH & Co. KG into the parent company Simba Toys GmbH & Co. KG was merged into the parent company Simba Toys GmbH & Co. The product lines of Noris-Spiele, Zoch and Schipper will remain as an independent division under the umbrella of Simba Toys and will be further developed. In addition to the outlook for 2019, the management also gave a review of last year. 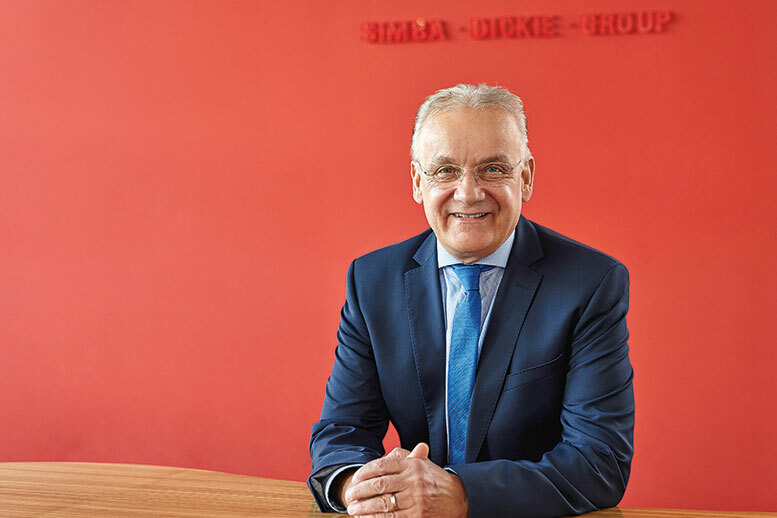 “The Simba Dickie Group achieved consolidated total sales of EUR 616.0 million in a very turbulent year in 2018,” says CFO Manfred Duschl. Compared to the previous year, this is a decline of 4.5 percent. The Smoby Group with 22.6 million euros less turnover and the Dickie Group with 4.7 million euros less turnover were particularly affected by this decline in turnover. Duschl is nevertheless satisfied. “Considering that major players in the market such as Toys R US, the Ludendo Group in France, the Blokker Group in Holland and only recently the company Top Toy from Denmark went bankrupt, a minus of only 4.5 percent with qualitatively even better sales can be regarded as thoroughly positive. The Simba Dickie Group generates 75 percent of its sales abroad. The main export nations in 2018 were France, Italy and England. For the Simba Dickie Group, the last year was marked by investments. The company entered the entertainment business by acquiring the Swedish company Ruta Ett AB, known for its animation series “Heroes of the City”. The Group expects further sales beyond France through the purchase of the French doll supplier Corolle. With the newly founded company SiSo Toys UK in London, the assortment business with toy concepts in the license area and for product lines that require marketing measures is to be developed and expanded. In addition, the Group has acquired a third stake in the Swiss specialist toy chain Franz Carl Weber. For this year, Duschl expects a challenging environment: “The year 2019 will remain turbulent. In the highly competitive market environment, e-commerce will grow and stationary retail will have to change and reposition itself. It cannot be ruled out that one or two surprises may come from market participants”.